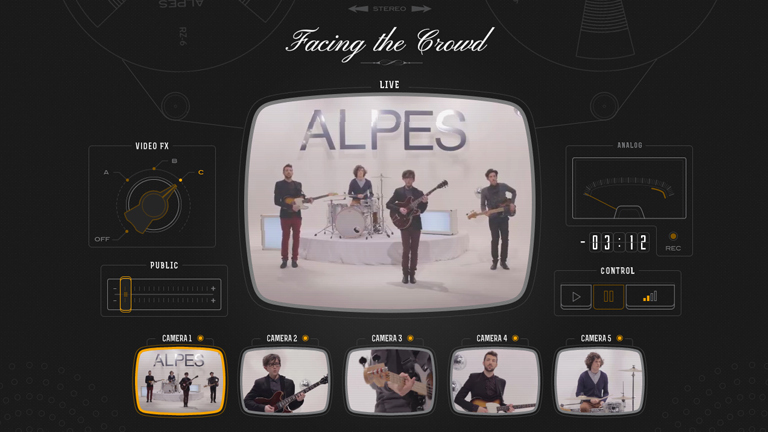 This great interactive music video created by Robin Pfrimmer a.k.a Robey, puts viewers in the shoes of a technical director responsible for the broadcast of an Alpes band performance. Users get to choose from the material provided by the five cameras, control the public’s voice and opt for one of the four possibilities concerning video effects. Sounds easy, right? Should you just so happen to find the outcome of your button-pushing unsatisfying, do feel free to make as many attempts as you want in order to reach ‘the perfect edit’. However, you might consider not applying for a job in television broadcasting any time soon! This great interactive music video created by Robin Pfrimmer a.k.a Robey, puts viewers in the shoes of a technical director responsible for the broadcast of an Alpes band performance. Users get to choose from the material provided by the five cameras, control the public’s voice and opt for one of the four possibilities concerning video effects. Sounds easy, right? Should you just so happen to find the outcome of your button-pushing unsatisfying, do feel free to make as many attempts as you want in order to reach ‘the perfect edit’. However, you might consider not applying for a job in television broadcasting any time soon!